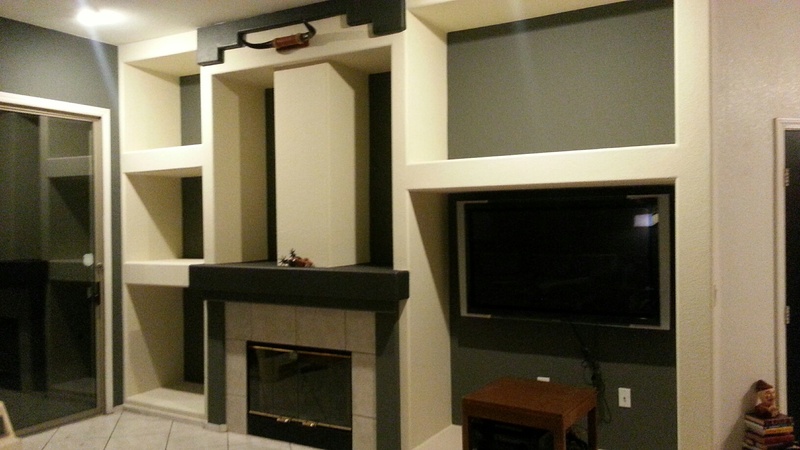 Our house has this crazy gigantic wall in our great room that houses a fireplace and multiple alcoves. I have a love/hate relationship with what the architect must have envisioned as a grand focal point in the design of this home. It is big. I suppose it is grand. But, it is also kind of funky and awkward. Here is what it looked like shortly after we moved in. The previous owners left their flat screen TV behind. Rather than taking it out (and putting it where?…there isn’t another good place for it even though it is difficult to watch all tucked back in there on the far right), we have decided to keep it in the same spot. The 3 big alcoves to the left and above the “media center” are most often used to display art, pottery, or hard to reach dusty fake plants by other people in my neighborhood. I’d prefer to use the space as storage. So, I changed plans and kept the backs of the alcoves dark, but popped the front with a light cream color. Muuuuuch better I think. 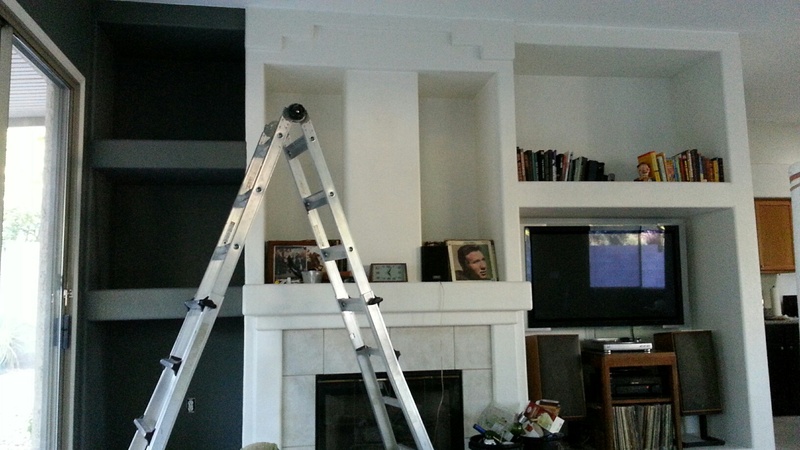 It is hard to tell from the photo above, but the detail above the bullhorns and the mantle are a darker blackish gray. 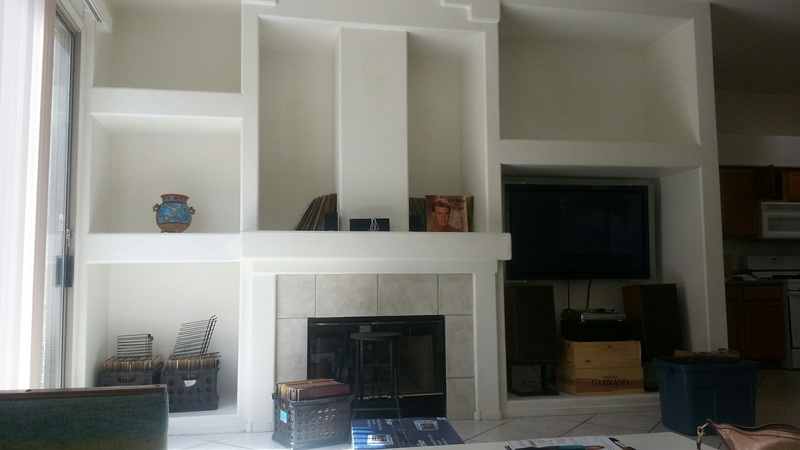 I still have plans to change the tile on the front of the fireplace and add some wood shelving, but it is a start. I’ll post again when I have more to show. 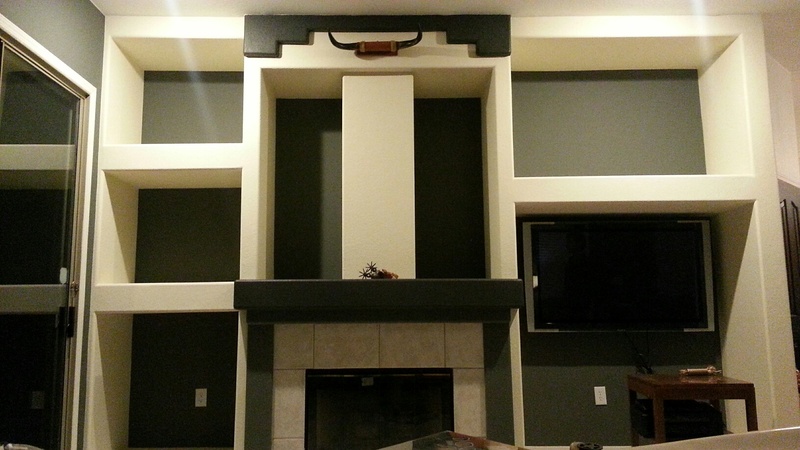 Colors: Sherwin Williams, Antique White 6119, Grizzle Gray 7068, Iron Ore 7069.